A tiny baby Irish Wolfhound who grows up quickly, so cute when they are this age. The print is a Limited Edition by Artist Martha Van Loan with an image size of 11x14 suitable to frame in a 16x20 mat and frame available in our framing section. Each print is signed in pencil and serially numbered by the artist. 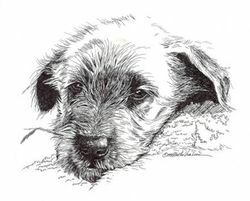 A wonderful addition to your Irish Wolfhound art collection.